Steamboat Springs resident Dean Vogelaar, middle, diffuses an argument between Routt County Sheriff Garrett Wiggins, right, and David Gibbs, left. Gibbs is the husband of sheriff candidate Kristin Bantle. 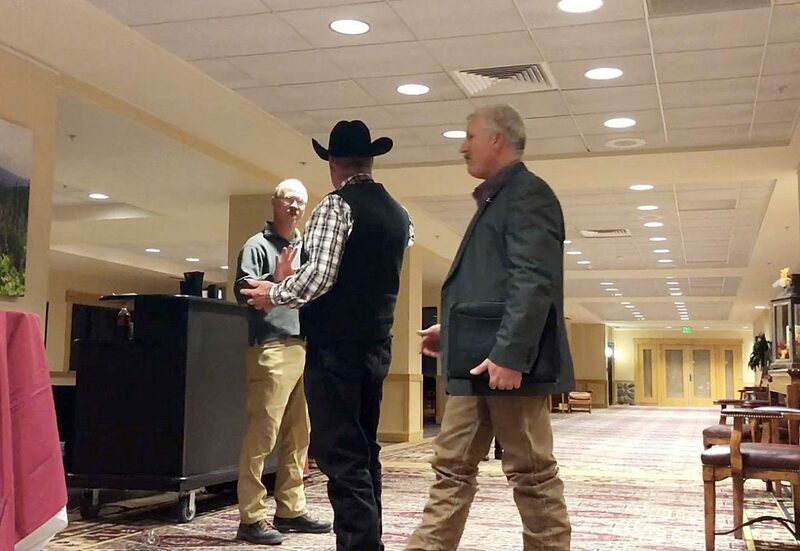 STEAMBOAT SPRINGS — A verbal altercation between Routt County Sheriff Garrett Wiggins and the husband of sheriff candidate Kristin Bantle after Tuesday night’s election forum led to both men reporting the incident to Steamboat Springs police. The altercation occurred in a hallway outside of the Burgess Creek meeting room at The Steamboat Grand where the forum was held. The forum included a segment where the sheriff candidates were asked to publicly respond to claims the candidates have made about each other’s integrity. Wiggins’ response prompted some boos from the crowd, and Bantle’s husband, David Gibbs, shouted at Wiggins from the back of the meeting room. After the forum, Wiggins and Gibbs got into an argument. Wiggins told Gibbs not to communicate with him, and Wiggins asked people who were standing nearby to call 911. The situation was diffused by Steamboat Springs resident Dean Vogelaar, and Gibbs walked away with Bantle. Gibbs contacted Steamboat police Tuesday night, and Wiggins contacted Steamboat police Wednesday morning. Wilson said neither Gibbs nor Wiggins wanted to pursue criminal charges. “They just want it documented,” Wilson said.